Totally unrelated to property - A very important date in the French Calendar: Le Quatorze Juillet, or Bastille Day. Blue, white and red flags will be on display throughout France the French and Francophiles around the world celebrate the country’s national day. Celebrated just 10 days after America’s Independence Day, Bastille Day marks a truly important date for France. 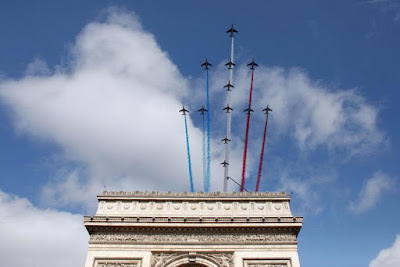 Bastille Day originated on July 14, 1789 when a group of revolutionaries and troops stormed the medieval Bastille fortress in Paris that was at the time being used as a prison for political prisoners. The storming of the Bastille marked the start of the French Revolution. The prison represented the hated Bourbon monarchy, and it was the end for King Louis XVI and his wife Marie Antoinette. France’s new revolutionary government ordered the Bastille prison torn down and the last stones were removed in 1790. Today, fireworks, parades and parties mark the modern celebration of Bastille Day. Among the celebrations, there is the Bal des Pompiers or a Fireman’s Ball. This tradition, which started in the 1930s, is carried out by fire stations opening their doors to host fundraising dance parties. The money collected goes to help funding of the fire stations all over France.